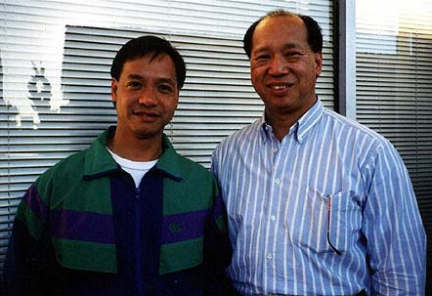 In the early 1980's, Tony began studying and practicing Wing Chun at Sifu Ken's home in Los Altos, California. Sifu Ken opened Tony's eyes to martial arts. Not only is Ken an exceptional Wing Chun master, Ken is also genuinely open and willing to expose his own group to other true martial art masters. That led Tony to his Qigong and Taiji masters later on in his martial art journey. Tony continues to maintain a close relationship with Sifu Ken and appreciates Ken's openess in sharing his martial arts expertise as well as his sincerity in exploring and exchanging martial arts topics with others. Wei zhang zhe hui : On the surface, it means to conceal for your elders, but we should take it one step further. Wei zhang zhe huireflects the attitude of respecting our seniors and the way of committing ourselves to martial art integrity while showing appreciation for the devotion and hard work of the past generations. This is one of the principles Sifu Ken always emphasized in his school; and, of all Sifu Ken's teachings, Tony benefits the most from this principle and it has a deep influence on Tony's standard for martial arts integrity.